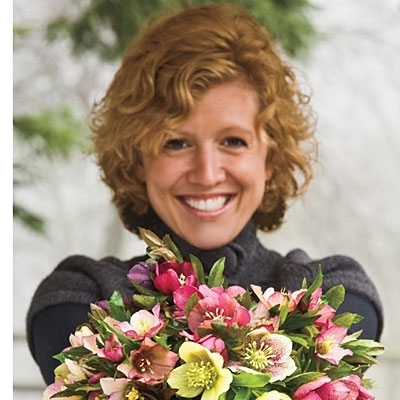 No matter where you live, whether you make your home in the snowy American Heartland, warm subtropical Florida, the frozen mountains of Maine, sunny southern California, or the moist Pacific Northwest, you can grow flowers like these in your own backyard. Even if you believe that you're cursed with a "Black Thumb", you will succeed. That's how easy they are. 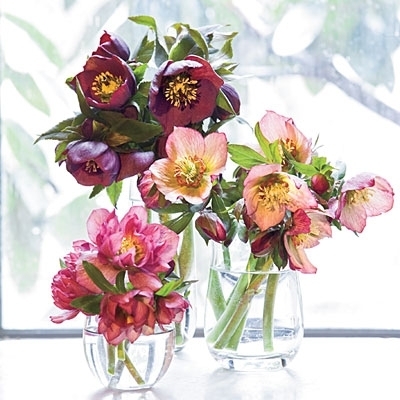 Not only will they grace your table with beautiful cut flowers, they'll provide color in your landscape at a time when there virtually is none. And....they're such long lived perennials that they'll still be thriving when they plant you in the ground. 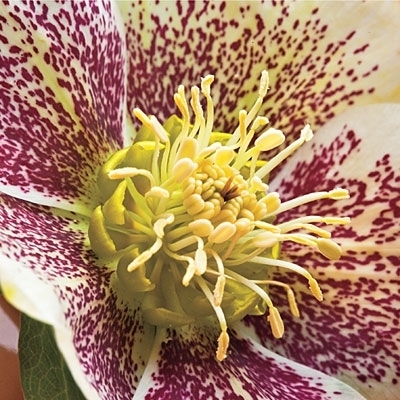 The 'Sunshine Selections' of Helleborus x hybridus are the result of over 30 years of painstaking attention to detail, careful parental selection, worldwide searching for the best germplasm and hand pollination. 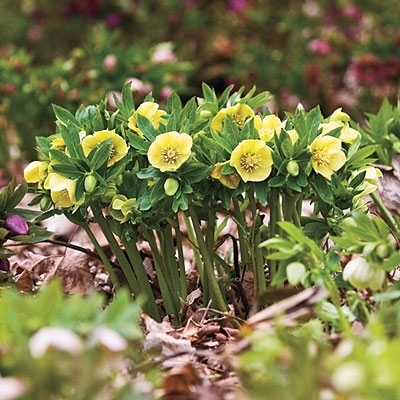 These evergreen, long lived, deerproof, perennial plants are guaranteed to reward you with a continual bloom in Feb, Mar, Apr and May. 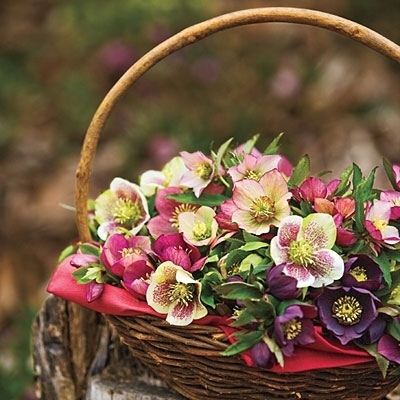 I've been addicted to Hellebores for quite some time now and I'd love to share my obsession with you by inviting you to come see more than 6 acres of Hellebores in full bloom. The best time for peak bloom is mid March - mid April. Please email me for an appointment. By the way, these glorious images were captured here on the farm by my friend and Photographer Extraordinaire, Ralph Anderson for a story about me written by my friend and Writer Extraordinaire Gene Bussell. That article can be found on page 84 of the January issue of Southern Living Magazine. You can read the full story here. I'd love to share the fruits of my labor with you and if you read on, you'll discover a very attractive and easy way to start your own addiction. What I'll be sending you are 2 year old, bareroot plants out of our 2" Anderson Treeband Pots® in full active growth. They'll arrive with their roots wrapped in long fibered, unmilled sphagnum moss. This material is antibacterial, antifungal, antiviral and a very useful material. 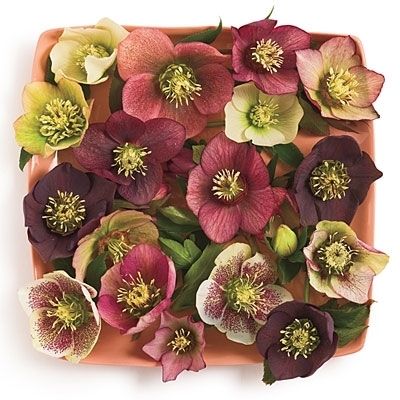 There's also a place on our order form to specify a shipdate, so you have the option to wait until Spring or a later date if your ground is still frozen, or to get them now and keep them on a windowsill, watching them grow until you are ready to plant them outside. The prices shown below include FREE SHIPPING on bareroot plants out of their 2" pots. If you would like to receive the plants undisturbed, in their pots, ( RECOMMENDED ) please add .95¢ per plant to cover the extra cost of shipping soil and pots.